This is a simple but decorative scroll sawing project that can be cut from any thin stock of scrap wood or plywood. Easily scale the pattern on your printer to make the size you want. A perfect beginner project for scouting, guides and 4H Club woodworking projects. Wood and/or Supplies needed: Scrap wood! Workshop Tips included: A full one page list of scrollsawing work shop tips! © 2011 WoodworkersWorkshop®. All rights reserved. The purchaser of this pattern is hereby granted a limited license to make no more than five (5) copies of this pattern for personal use or to sell at craft shows. The written consent of WoodchuckCanuck.com, Inc. is required to build, copy or sell more than five (5) copies of this pattern or to make more than five (5) finished parts any section of this pattern. Any further copying or other use of this pattern, in whole or in part, such as making kits from pre-cut templates, mass production or commercial usage, or any other unauthorized use, is strictly prohibited. Please see the “Copyright & Store Policies Page”. 3D Holiday Nativity in Wood Scrollsaw Woodworking Plan. 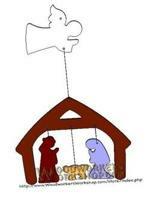 Nativity Life Size Silhouettes Yard Art Woodworking Pattern. Our nativity scene can easily be made in a couple hours. Personalize your yard art by painting it however you like. Display it in either direction. Custom sizing available.